Save on essential online training! Learn about eight of the world's most widely adopted NFPA® codes and standards for one low price -- including the National Electrical Code® (NEC®), NFPA 72®, and NFPA 101®. 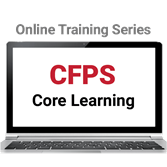 Save time and money on must-have code training with the CFPS Core Learning Series. Anyone responsible for the application of fire safety, protection, prevention, and suppression technologies needs to understand basic concepts in NFPA codes including NFPA 13, NFPA 20, NFPA 25, NFPA 70®, NFPA 72®, NFPA 101, and NFPA 654. NFPA provides instruction that's vital for your work -- online in your own time frame -- with this new training series. Work at your own pace to gain the type of critical knowledge needed for job success, and help prepare for accreditation programs such as the NFPA Certified Fire Protection Specialist (CFPS) program. Anyone involved in reducing fire loss, either physical or financial: risk managers, loss control specialists, fire officers, fire marshals, fire inspectors, safety managers, fire protection consultants, designers, engineers, code enforcers, facility managers, and others who have responsibilities dealing with the application of fire safety, protection, prevention, and suppression technologies. Complete this eight-hour course series and qualify for 0.8 CEUs. Completion of each individual one-hour course qualifies you for 0.1 CEU. Upon successful completion of a course or the course series, participants will be prompted to download the CEU certificate directly from the course site.